Pearl Beach is one of the most beautiful beach-side village on the Central Coast of NSW, Australia. True to its name, Pearl Beach is a 'Gem' located on the western shoreline of Broken Bay, sharing the peninsula with nearby Patonga. Pearl Beach is a unique exception when compared with other areas of the Central Coast where rapid growth has been the norm over the past thirty years. Residences have been constructed to blend with the local vegetation which, over the years, has been maintained mostly in its original pristine condition. The appearance to most visitor's is one of bushland with houses rather than the expected opposite. The area is home or a weekend retreat for some of Sydney's media personalities. Today, Pearl Beach is home to around about four hundred plus residents. 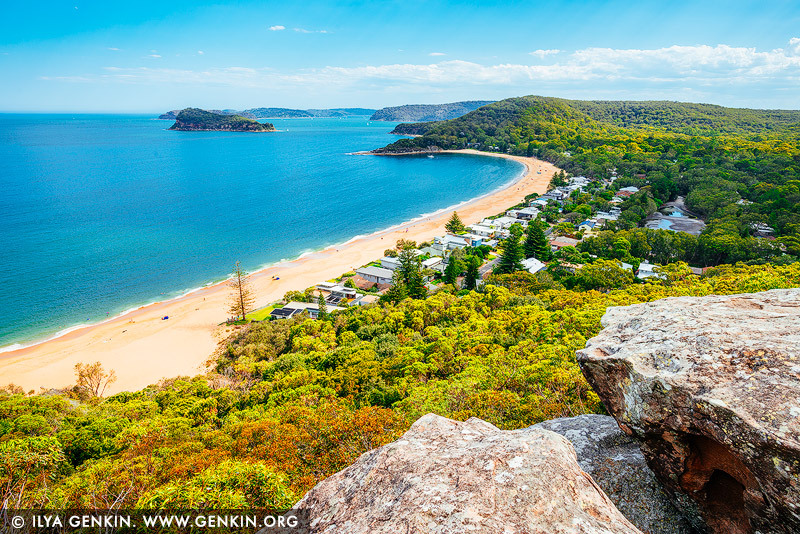 This image id AU-MT-ETTALONG-LOOKOUT-0003 of Pearl Beach from Mt Ettalong Lookout, is copyrighted © by Ilya Genkin. This is not a public domain image.